Most recently, Nick was awarded for Achievement in the Arts by the Pennsylvania State Senate and gave two significant industry speeches as a result of that act by the State Senate. Aside from his experiences as a music producer and business owner, Nick has Extensive Fundraising experience from theme conceptualization to event production and management for clients including: The Cleveland Clinic, The American Cancer Society, Major League Baseball, NBC, The NFL, Federated Investors (New York, San Francisco, New Mexico, Kansas, Naples Pittsburgh, Boston), The American Heart Association, Childrens Hospitals of Pittsburgh and West Virginia, Ronald McDonald House, American Diabetes Association, Pittsburgh Zoo, Mellon Bank (Pittsburgh, Boston) and more. Nick’s Extensive production and event experience has led clients from across the U.S. and around the world including Okinawa, New York, Phoenix, Washington, Boston, Amelia Island, St. Louis, Las Vegas, Los Angeles, Chicago, Seattle, Canada and Nashville to seek out his experience and advice. 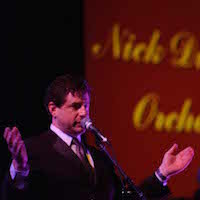 Additionally, Nick has Extensive production experience including sound production, light production video Production and technical direction for large national acts including Jimmy Fallon, KC & The Sunshine Band, Ray Charles, George Benson, Mary Tyler Moore, Joan Rivers, The Temptations, McCoy Tyner, Jimmy Fallon, Coretta Scott King, Gladys Knight and more. He has also acted as Director of Communications for Meeting Professionals International and was recognized with several awards for achievement in the meeting planning industry. Numerous awards for Achievement through ISES and MPI. Featured touring Artist with the Billy Price Band, The Late Edition, B.E. Taylor and the late Emily Remler. Performed with numerous national acts such as The Temptations, Stars of the Lawrence Welk Show, The Four Tops, The Fifth Dimension, Al Martino, The Drifters, Frankie Valli, Little Anthony and Lou Christie.